“A horse is here to stay, but the automobile is only a novelty — a fad.” This was what the president of Michigan Savings Bank said to Henry Ford’s lawyer, Horace Rackham, in 1903, discouraging him to invest $5,000 in the new car company. Sixteen years later, Rackham sold his Ford shares for more than $12.5 million, earning IRR of more than 150 percent per annum. Lending, one of the biggest industries, is currently undergoing a transformation. As it was with the automobile industry transformation, a number of modern innovators will probably face serious difficulties, some will merge with competitors and some will just disappear. Of course, the emergence of a new huge and rapidly growing industry has always attracted the attention of journalists. At the same time, as all the changes happen very quickly and there are few experts who really understand the issues, news headlines are often absolutely misleading in respect of the developments. One of the news items that have received considerable attention recently is the possible downgrading of Moody’s rating on the CHAI securitization bonds (securitization of loans issued through the Prosper platform implemented by Citigroup). Such statements create an impression that something has gone wrong with the alternative lending market in general, and P2P loans in particular. Without trying to understand the actual nature of P2P loans and not having the necessary statistics, many investors tend to believe publications of that kind. Reading the news makes one feel that the situation around P2P lending reminds us of the subprime crisis in the U.S. in 2008 — but if you look at the facts, you can see that is simply not the case. I suggest looking at the facts and trying to understand the reason for the possible downgrading of CHAI securitization rating by Moody’s. 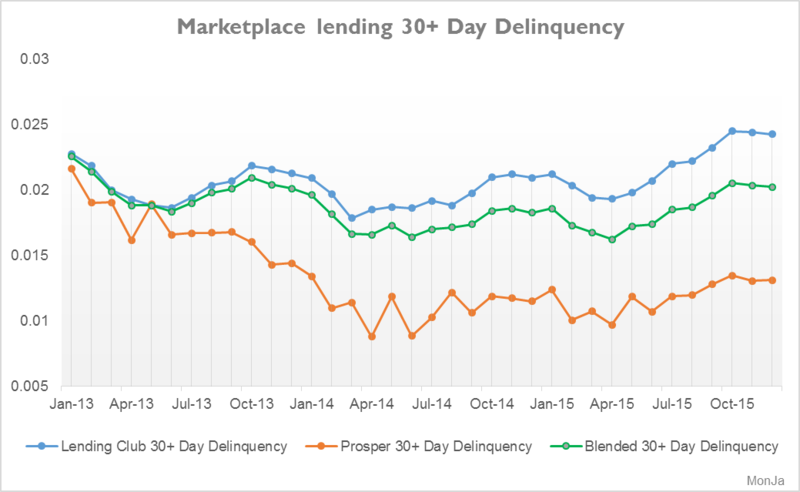 The graph below shows cumulative delinquency on Prosper loans, issued by the platform itself, on a quarterly basis. It is easy to notice that since the introduction of the Prosper 2.0 scoring system, the delinquency curves are almost identical from quarter to quarter. The graph clearly shows the stability of credit quality of loans issued by Prosper; 2015 is no exception. 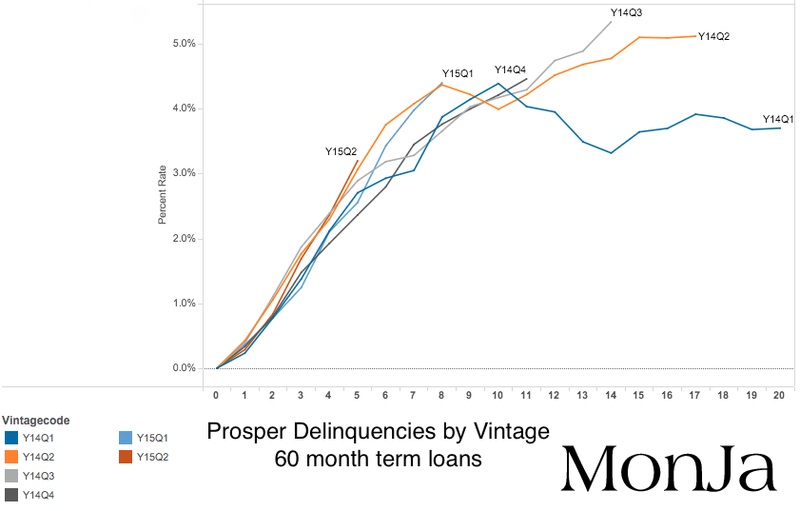 Next, we should examine the graph of delinquency on 60-month term loans charted by MonJa (here is the link to the complete study). On this chart, you can once again see very clearly that delinquencies on loans behave the same way as in the previous years. Next, look at the figure below, provided by MonJa, which shows delinquencies on loans issued by P2P platforms in general — we can clearly see that delinquencies do not grow and have remained at average levels for the past few years. If the overall situation with delinquency is stable, can there be something wrong only with the loans that are the security in CHAI securitization? Let’s examine in more detail what is the underlying of CHAI. The average FICO score of the borrowers in CHAI underlying is 703, which means that the loans are granted to mostly prime borrowers. The average rate on the loans is 13.2 percent, 63 percent are loans with 36 months maturity and 37 percent are loans for 60 months. Let’s look more closely at the cumulative delinquency on securitization of various alternative lending platforms as of this writing. The chart above (the source chart is here) suggests that the delinquency on most securitizations are at their planned level, and the spread between the actual cumulative loss value and trigger value at which the cash flows received on loans begin to be withdrawn from the holders of junior classes of bonds in favor of the holders of the senior classes remains unchanged (except for a few securitizations). 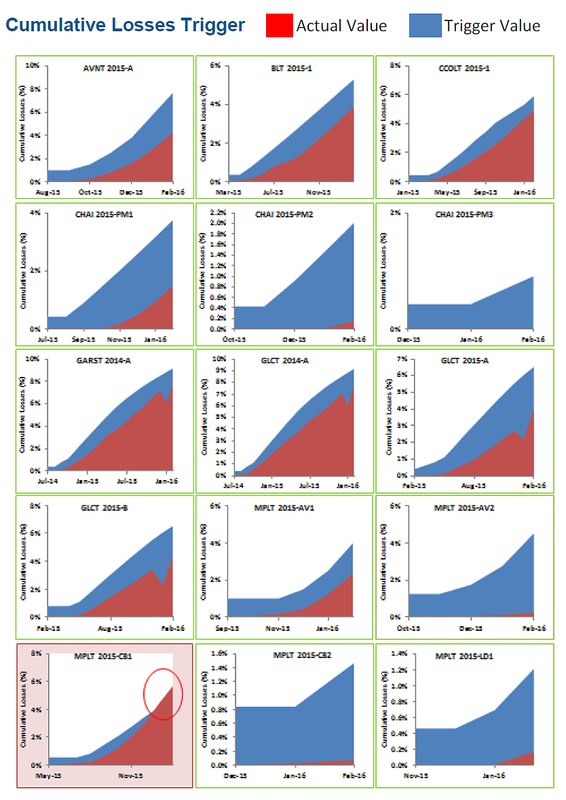 Prosper’s securitizations, which include CCOLT, as well as CHAI PM1, CHAI PM2 and CHAI PM3, all demonstrate a predictable and stable performance. The only securitization that fails to go as planned is the one undertaken by Jeffries for CircleBack Lending (marked in red in the lower left corner of the chart), but CircleBack issue loans to borrowers with lower FICO scores. And yet, if everything is going as planned, why did Moody’s place the rating of bonds on CHAI securitization on review with the possibility of its downgrading after only a few months upon its assignment? Moody’s explains that this is due to the increase of expectations from 8.5 percent to 12 percent in respect of the level of defaults on the portfolio of loans that serve as underlying for bonds. It looks very strange if we take into account that the initial forecast of Prosper on defaults on this portfolio was 9.5 percent to 11 percent. Why did Moody’s assign the rating based on the default rate of 8.5 percent if the platform itself considered that the level of defaults will be higher? MonJa believes that Moody’s simply made a mistake in their initial assessment; this seems very convincing if we analyze the data presented in the charts above. As regards P2P loans, this chart takes into account two securitizations: CCOLT and CHAI, both with loans issued by Prosper as the underlying asset. Despite the fact that the average FICO score for CCOLT is 706 and 703 for CHAI (FICO scores for credit cards range from 679 to 710, and for Auto Subprime Loans the value is from 650 to 678), the ratings assigned by Moody’s for securitization on P2P lending are significantly lower compared to the ratings on other asset classes with weaker FICO scores of the borrowers. 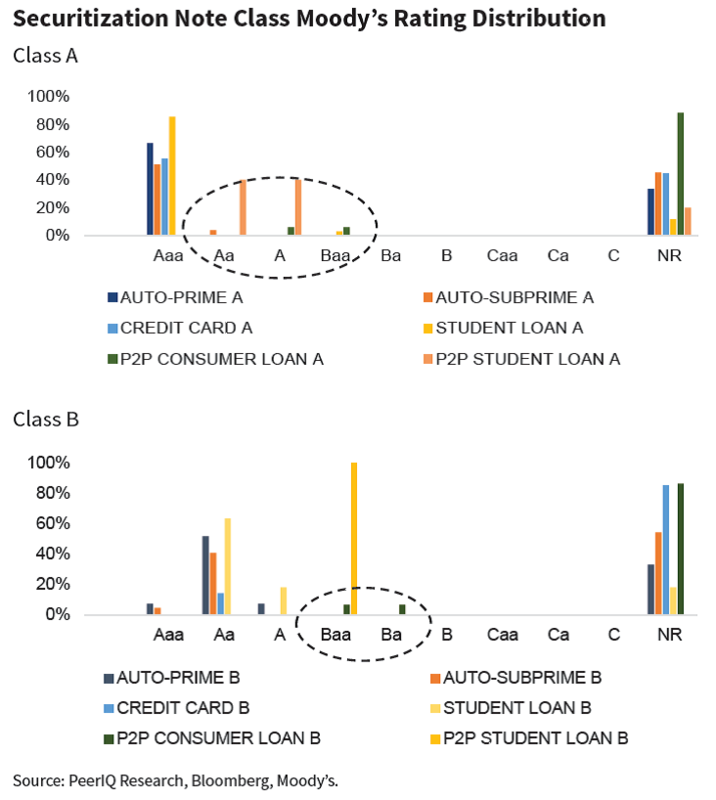 In case of car loans, this can be explained by the fact that the car is used as collateral, but it should only have an impact on lower tranches, not the senior classes of securitization. I believe the difference in the rankings is because rating agencies do not have an opportunity to calculate the risks of P2P lending, as this sector has not completed a full loan cycle with sufficiently large amounts. I think this is also largely because rating agencies were miles out in their calculations back in 2008 when they assigned high ratings to some securities, which became almost worthless afterwards, and now they are skeptical about anything new. It is a negative factor for P2P lending platforms such as the LendingClub and Prosper (as the funding of loans is becoming more expensive), whereas those who invest in loans may benefit from lower ratings as the rate of return is greater than the actual risk of the instrument. As a result, we again have a situation where we need to thoroughly analyze the details to make a conclusion that everything is going exactly as planned — but reading the headlines can make one sure that alternative lending is heading to a collapse. There is no collapse, and no signs of deterioration of loan quality or increasing loan delinquency, and I think those who will understand the mechanisms of operation of alternative lending and the real risks involved — instead of just relying on the data presented in the press — will get an opportunity to achieve superior returns on their investment. Fintech and alternative lending are now in a situation similar to that of the automobile industry at the beginning of the 20th century.